Get your stinking hands off me, you damn dirty human! Tim Burton’s much-maligned remake is one that, like Roland Emmerich’s Godzilla, I can’t find too much to get upset about. By this point Burton had finally worked out how to put an action scene together (just look at his Batmans if you need evidence that it wasn’t his forte) but other than honing his technical skills it’s difficult to see what attracted him to the material. Much of the design work is very good, but there’s nothing here to reflect his offbeat eccentricities. Aside, perhaps, from Wahlberg’s chimp. Yes, Wahlberg. The most unlikely lead imaginable for a Burton film, an antidote to whacky. The apes are all pretty good; Tim Roth, Helena Bonham-Carter, David Warner and I have to admit I rather like the ending nonsensical or not. 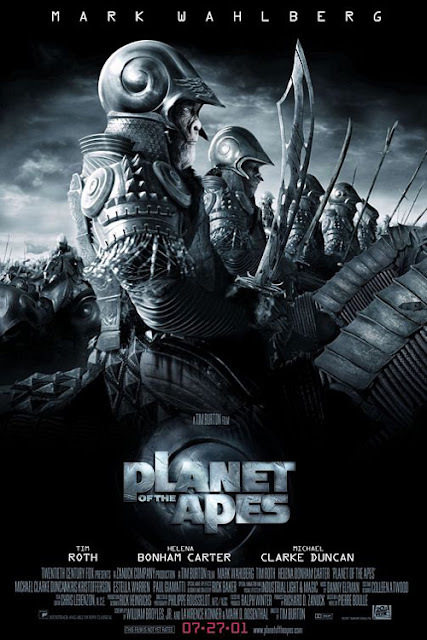 Commercially this did better than the latest apes iteration, so it has to go down as a rare example of a critical drubbing putting the kibosh on a follow-up.